Hildebrand » Roger Perron Inc.
With our home expansion and remodeling project completed, we wish to tell you how very pleased we are with the results. First off, the design you prepared is truly first rate! The new floor plan is well laid out and efficiently utilizes all the available space. You did a wonderful job of blending together the existing and new portions of the house. This was a major project which required us to move totally out of the house. 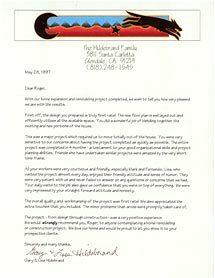 You were very sensitive to our concerns about having the project completed as quickly as possible. The entire project was completed in four months – a testament to your good organizational skills and project planning abilities. Friends who have undertaken similar projects were amazed by the very short time frame. All your workers were very courteous and friendly, especially Mark and Fernando. Lisa, who visited the project almost every day, enjoyed their friendly attitude and sense of humor. They were very patient with us and never failed to answer on any questions or concerns that we had. Your daily visits to the job also gave us confidence that you were on top of everything. We were very impressed by your straightforward attitude and honesty. The overall quality and workmanship of the project was first rate! We also appreciated the extra touches that you included. The minor problems that arose were promptly taken care of. The project – from design through construction – was a very positive experience. We would strongly recommend you, Roger, to anyone contemplating a home remodeling or construction project. We love our home and would be proud to let you show it to your prospective clients.